Asking to be seated in a booth when patronizing a typical restaurant does not usually lead to an artistic experience. 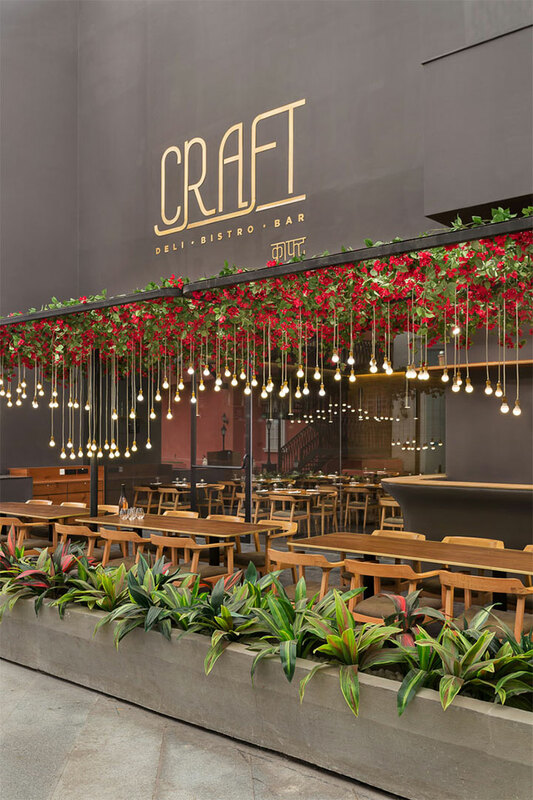 This is not the case when it comes to the Craft restaurant located in the Phoenix Market City shopping center in Mumbai, India. 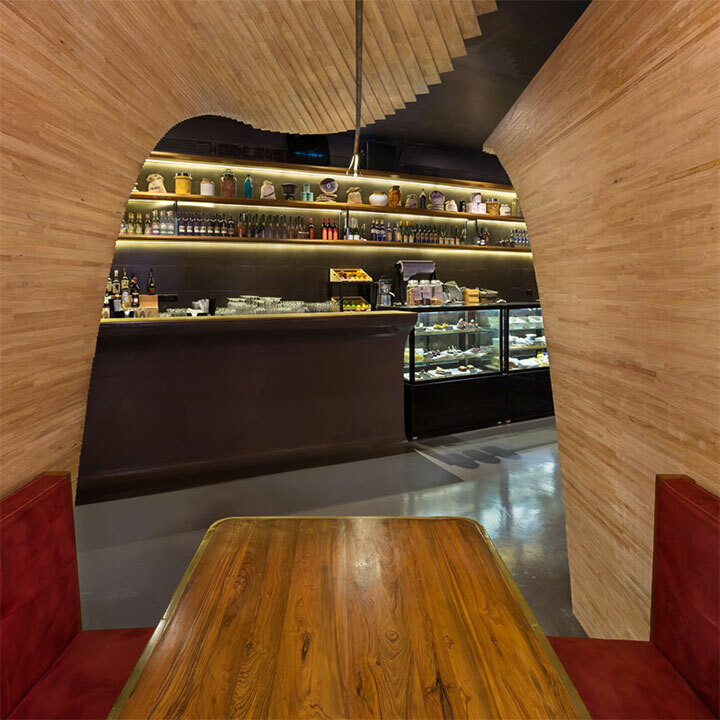 Nested underneath large sculptural wood constructions, the benches and tables give the patrons not only a feeling of intimacy, but one of importance. 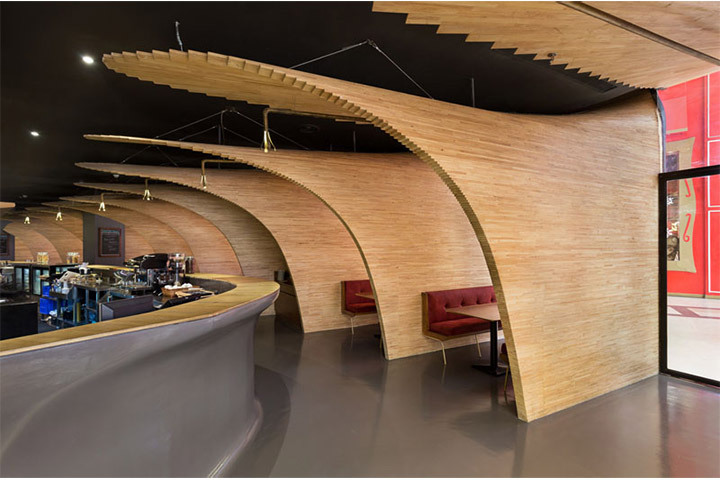 It is only natural, since, raising from behind the benches, wood dividers grow into an expansion of curves that follow the line of the ceiling and end up enveloping the booth area. It is as if not only the booth is reserved for the customers, but also the space above it. 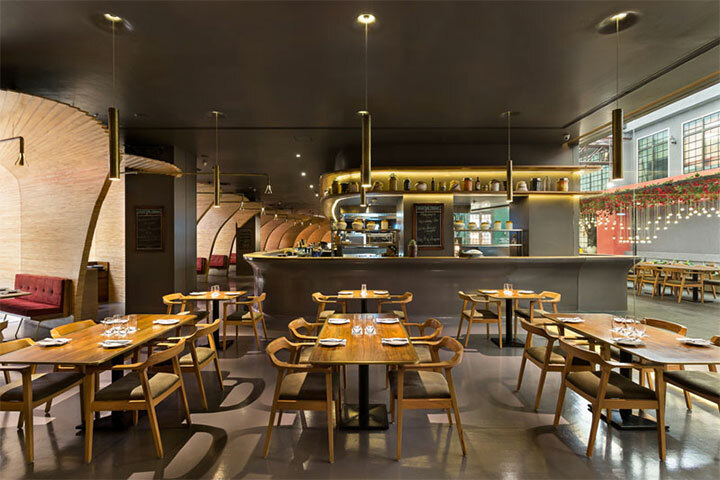 Designed by the Mumbai-based Sameep Padora & Associates (sP+a), the restaurant interior mixes the innate warmth of wood with the visual appeal of large, wide curves. It is a double win for an interior that otherwise tries to keep its lines simple and modern. 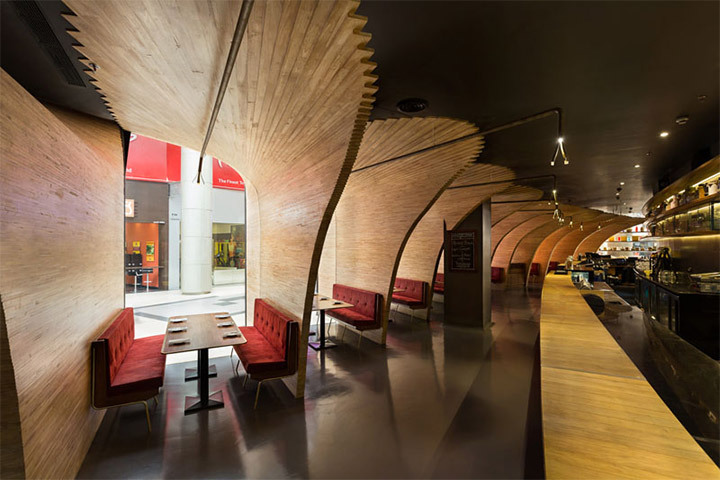 The wood structures become the main element of design that define the interior of the restaurant. However, this is not just a way to spruce up its interior. 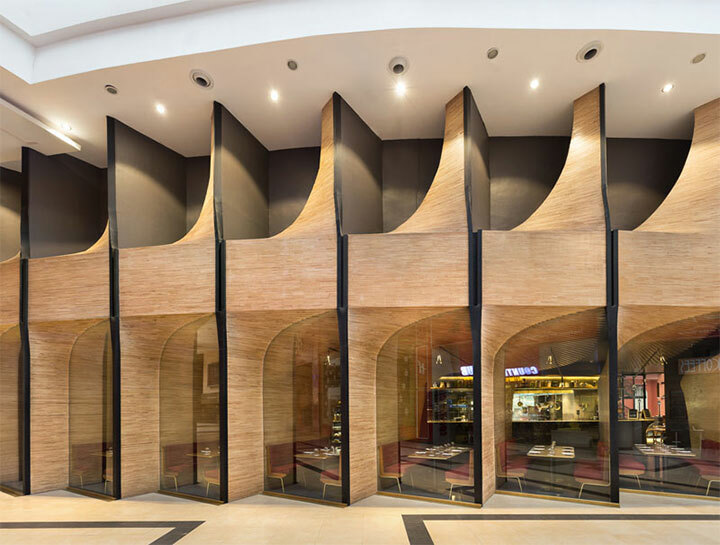 The wave-shaped dividers are part of larger structures that extend from the exterior into the interior of the restaurant. 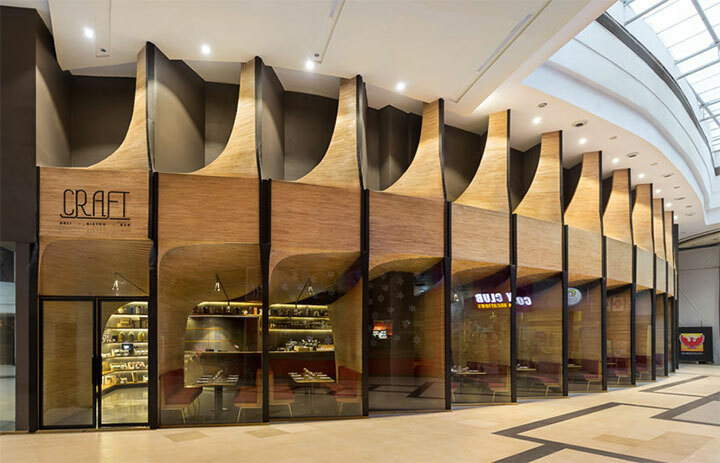 Large arcade-shaped wood walls draw the eye upwards, where they end into a row of sculptural shapes. The positioning of these structures creates individual windows for each booth and makes each of them the center of a large expansion of curves. It is a design that takes the idea of cohesiveness and flow to a whole new level. Surrounded by this enveloping structures, the client feels calm, protected and safe. Inside, the wood forms are echoed by the mid-century chairs surrounding the tables in the central open dining area. 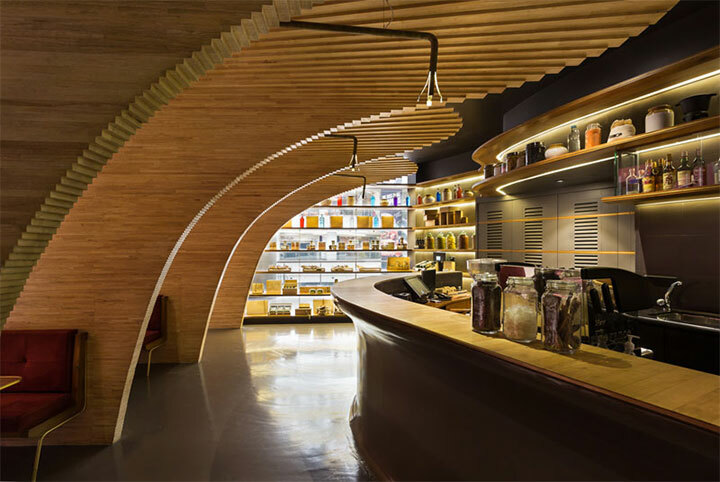 The curves of the wood dividers are mirrored in those of the chairs and in the long, flowing lines of the counter and bar shelves. Finally, in the back of the restaurant, a different dining area steps aside from heavy wooden structures and replaces them with flowers and light flowing from the ceiling. It is a perfect balance to the massive wooden constructions, to which they respond with color and warm light.